I saw this awhile back that it was only being sold in Japan but now it's available here if anyone is interested in one. Three realistic "jellyfish" drift around, propelled by an internal water pump, against a luminous rock backdrop. Lit by six LED black lights, the jellies give off an eerie, ghostly glow. Just add water!! 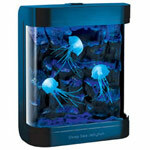 The price of having this cool jellyfish tank on your desk is only $29.98. Great gift idea also! Mine didnt work at first , the fish just floated at the top for day, until they sank one by one, then they started to swim when I put it on. Its a very good product but it makes way too much noise when the fan comes on, so its not very soothing…it should have been made whisper quiet.